This is a fantastic model recreates the famous movie moment when Marilyn Monroe stood over the sub-way grating in the Seven Year Itch. 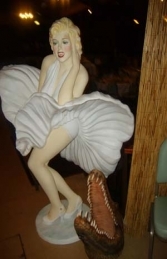 Our Marilyn Monroe model with blowing dress stands over an electric fan concealed in a 54cm square box. The statue is ideal to use to create movement and interest in a film and movie themed area or at the entrance to a Hollywood themed party or event. The white dress is made of a very light fabric which billowes beautifully in the breeze of the fan. The facial features on this model are very detailed and she has realistic hair which adds to the glamour of this figure. 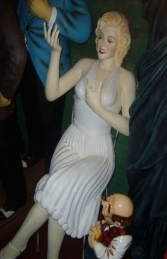 This life-size cold-cast poly-resin and fibre-glass 3d figure of the actress Marilyn Monroe is ideal for music, entertainment and Hollywood themes, Movie and film displays, advertising or drawing attention to your business or for the home and garden.